2nd : Queen size bed that can convert into twin beds. 2nd : Marble bathroom, shower cabin, wash basin, toiletries. – A second separate WC ajacent to the kitchen. 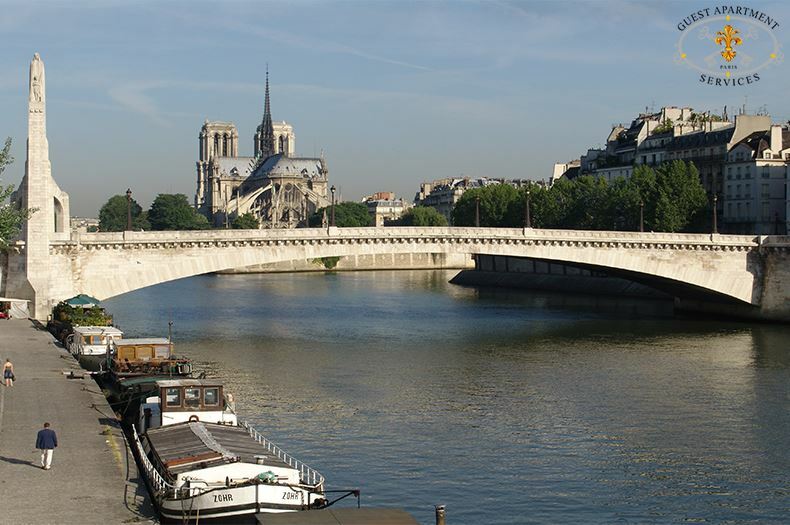 Stunning view on Ile Saint Louis, the Seine River & Notre Dame Cathedral. 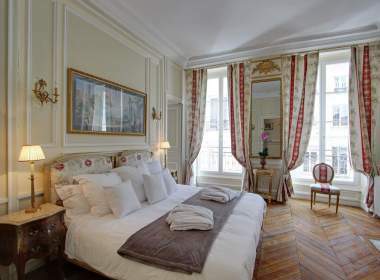 On the left Bank, this luxury apartment is ideal for a vacation in Paris. 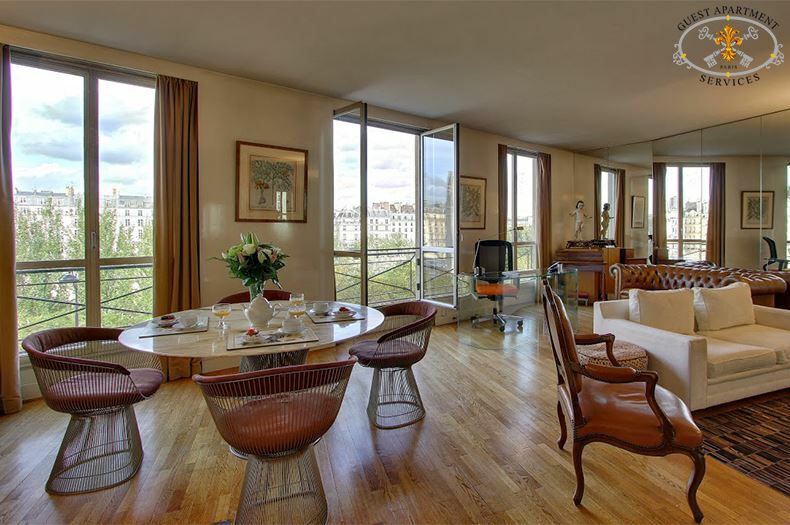 This apartment is ideally located along the river, with magnificent views of Seine River, the Isle Saint Louis and Notre Dame Cathedral. There are numerous fine shops situated around this property. 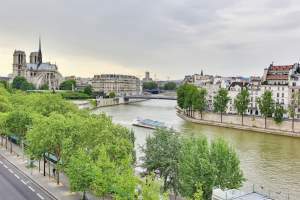 Crossing the bridge, you can visit the Ile Saint Louis for the daily conveniences of a bakery, pharmacy, post office, grocery store, restaurants, and other fine shops with typical French products. 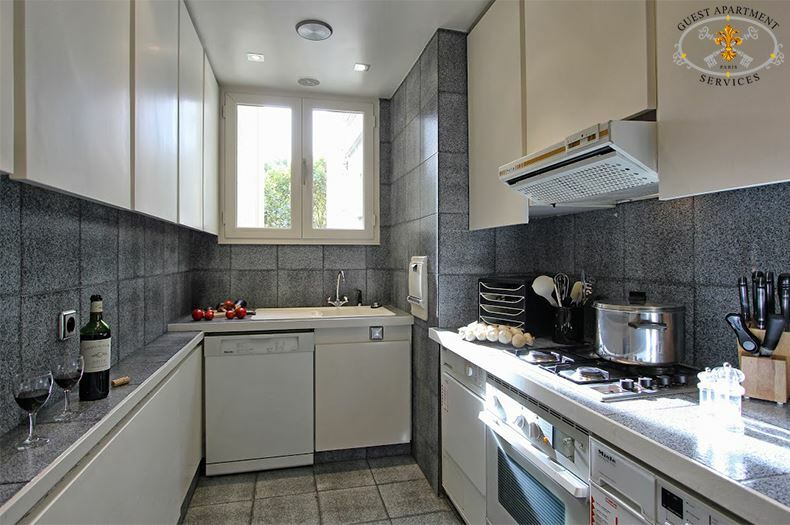 Along the beginning of Boulevard Saint Germain, many other conveniences are available. 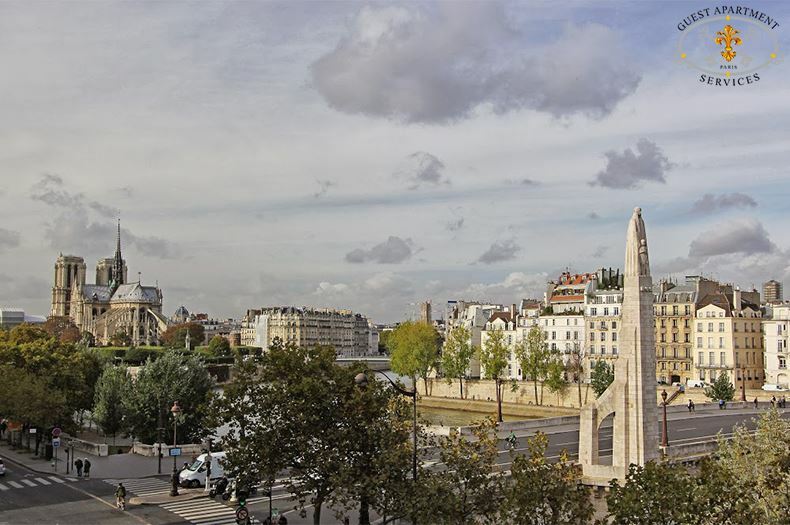 A Contemporary marble floored entry with coded security, intercom and a private elevator gives direct access to your 110 square meters, light filled apartment with its view of the Seine River. 4th French Floor. 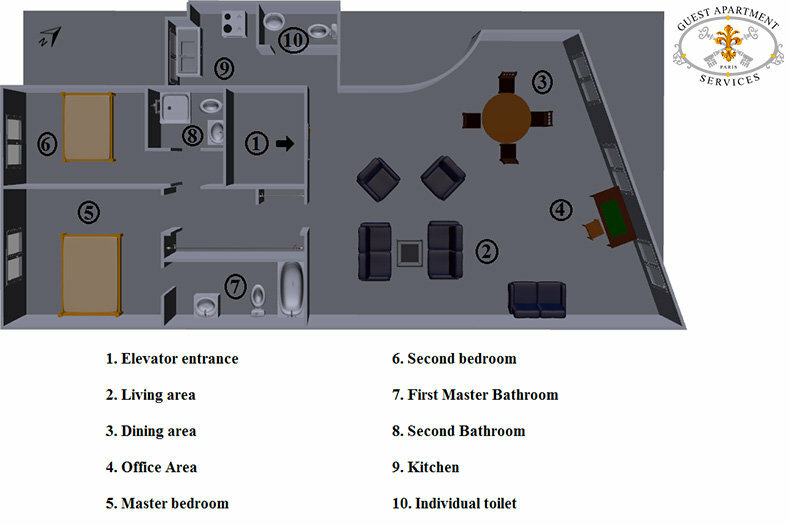 This is a handicapped suitable apartment. 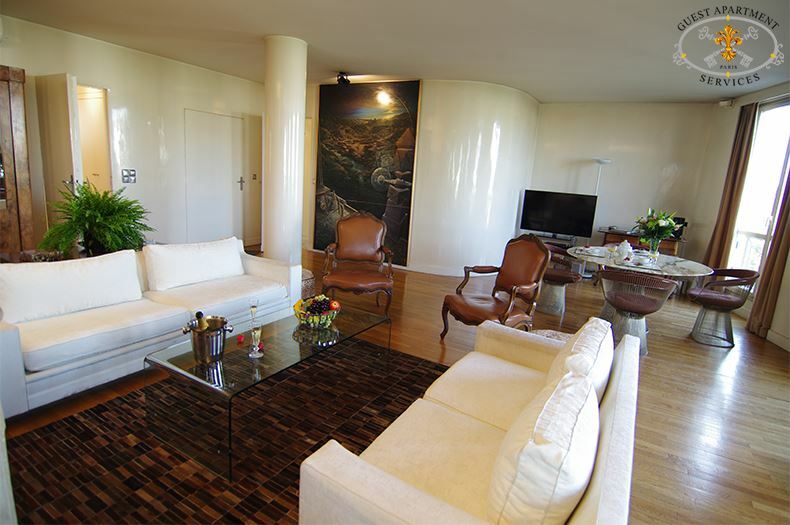 A blend of antique and luxurious contemporary furniture creates a strikingly elegant atmosphere. The private elevator takes you to the bright and spacious reception room with its three floor to ceiling windows. One whole wall is mirrored to reflect the panoramic view of the Seine River. This apartment has an enchanting atmosphere. 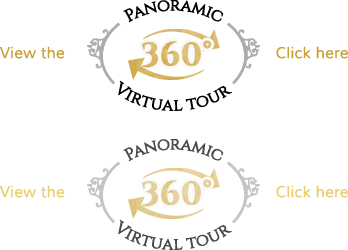 The mirrored wall reflects and provide a panorama on the Seine River . 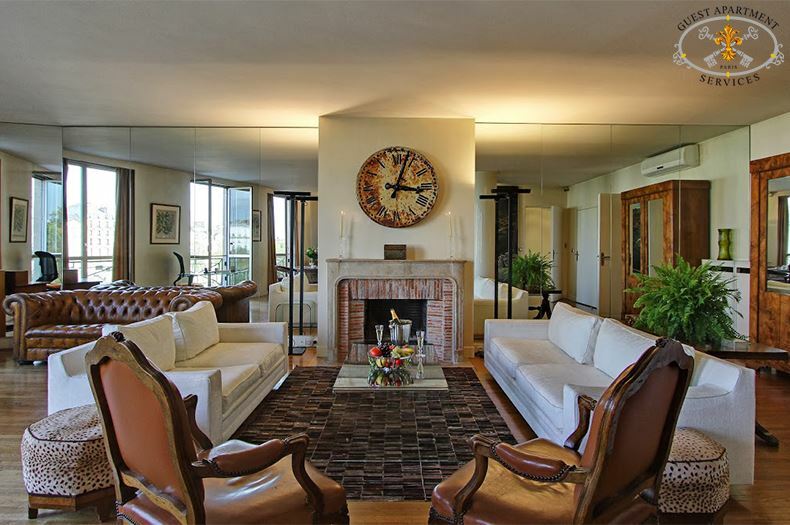 At the centre of the room, a large stone and red brick fireplace is decorated with a huge antique station clock. Left of the entry is a gigantic modern geometric relief painting. Two large, off white couches face each other over a low glass topped table. 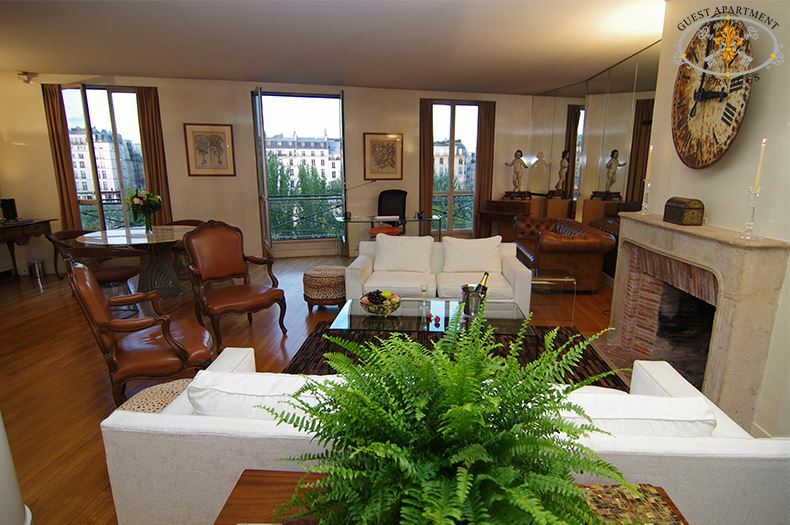 A pair of symmetrically placed animal hide ottomans and two magnificent Louis XIV leather arm chairs complete this area. 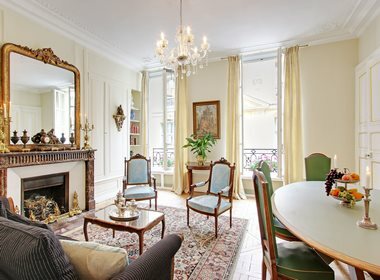 Left of the chimney, the cherub statue shares pride of place with a small tasteful secretary with Asian ornaments, and a large comfortable leather couch offers a perfect place to watch the Seine flow majestically below your windows. The office area has a unique glass desk with fax and phone and enough space to work comfortably. The dining area faces the floor to ceiling windows and has a large, round marble table on a contemporary iron base, and pink upholstered chairs. 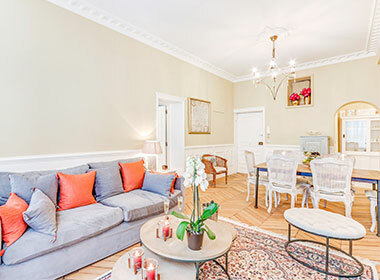 The large reception room has cable TV (including all main international channels) and stereo system with CD player on an exquisite English table. The superb wooden armoire fitted with mirrored shelves, displays silverware. A long corridor off the living room is fitted on both sides with built in closets and storage, offering plenty of room for your personal belongings. 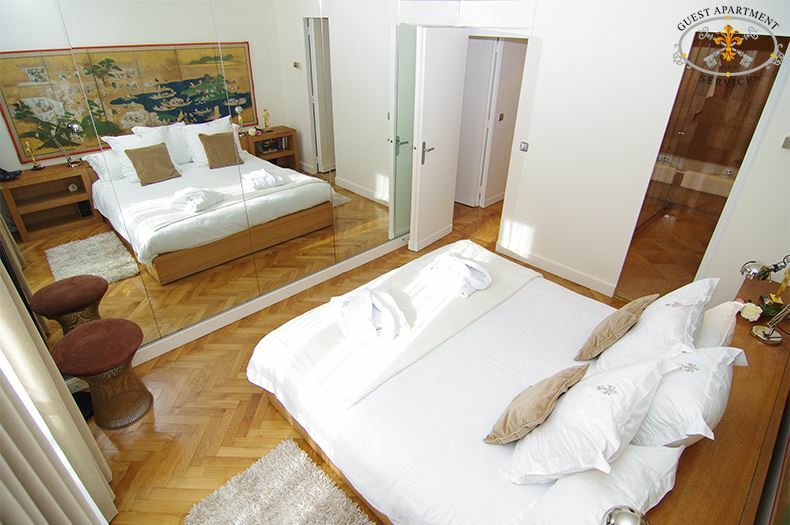 At the end of the corridor, the master bedroom is decorated with light pink carpet and drapery, and sheer curtains in front of the double glazed windows. The King size bed has a marvellous leather and fur cover, and a pair of large cube shaped side tables with reading lamps. 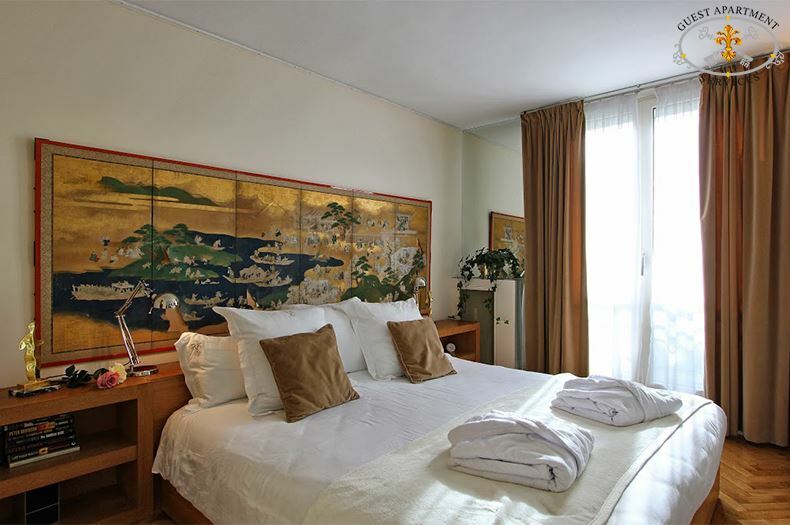 A delicate Japanese painting hangs above the bed and a large portion of one wall is mirrored . 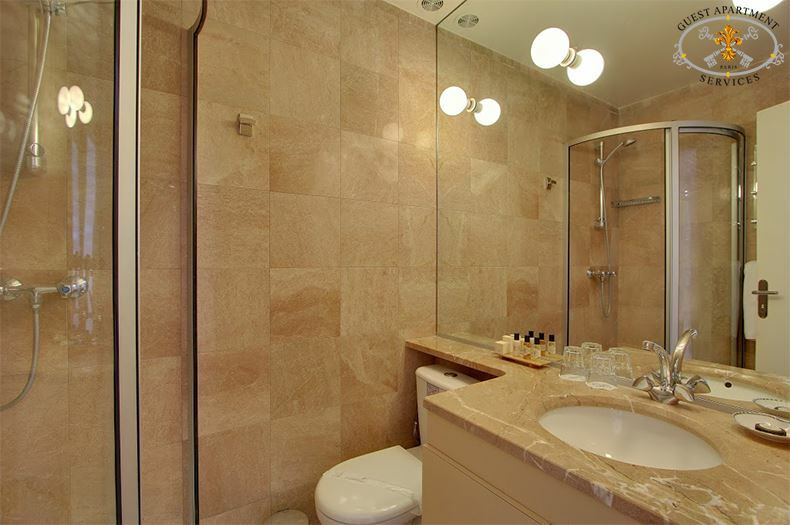 The luxurious master bath has a stylish bathtub with shower, built in shelving, and marble topped vanity with a large, brightly lit mirror, toiletires, and hair dryer. WC present. 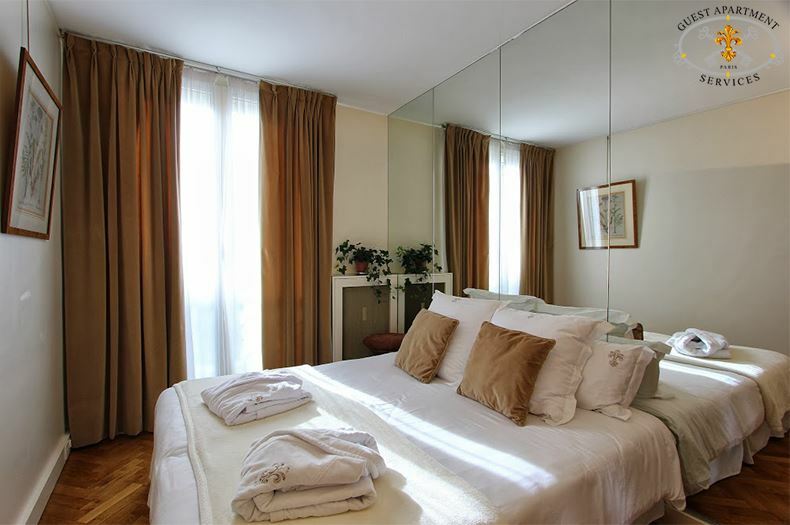 Next to the master bedroom is a second bedroom in light pastel patterned fabric, carpeted floor, double glazed windows, partially mirrored wall, and a comfortable work desk, resembling a wardrobe. 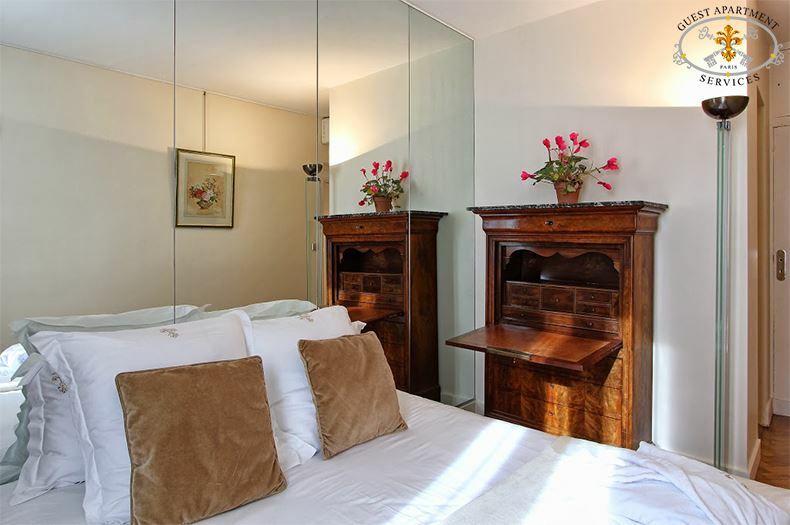 This second bedroom offers a Queen size bed which can be converted in twin beds. 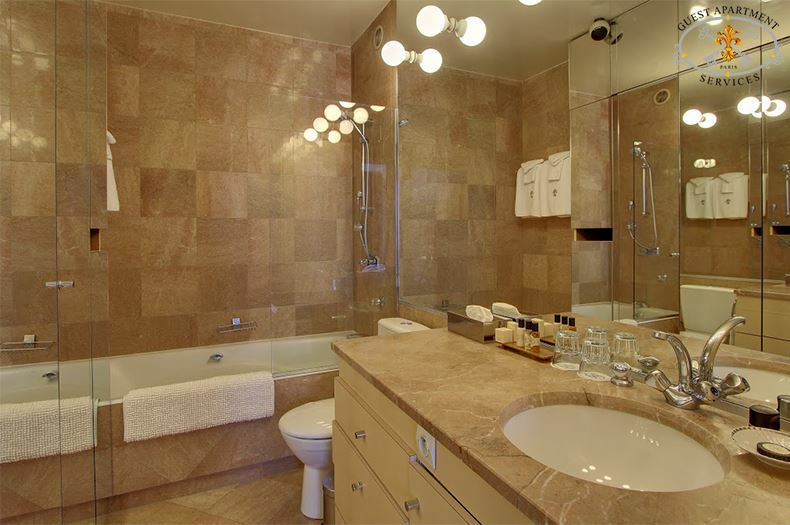 A second marble bathroom has a shower cabin, wash basin, toiletries. ​A second separate WC ajacent to the kitchen. The L-shaped kitchen is fitted with custom made cabinets, and a large blue tiled backsplash. A vitro-ceramic cook top over a built in oven is flanked by washer and dryer. Convenient appliances like refridgerator and freezer section, toaster, coffeemaker, kettle are provided, along with iron and ironing board in a large cupboard. 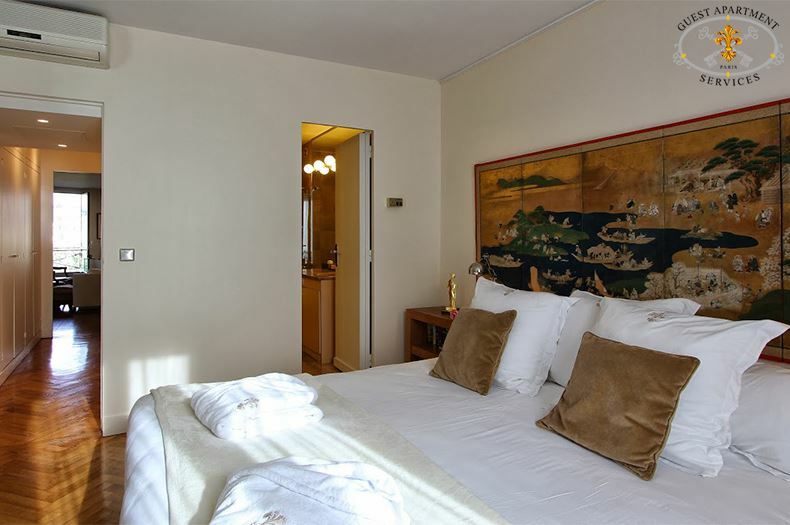 This Paris apartment is air conditioned and secured by a entry code and intercom device . 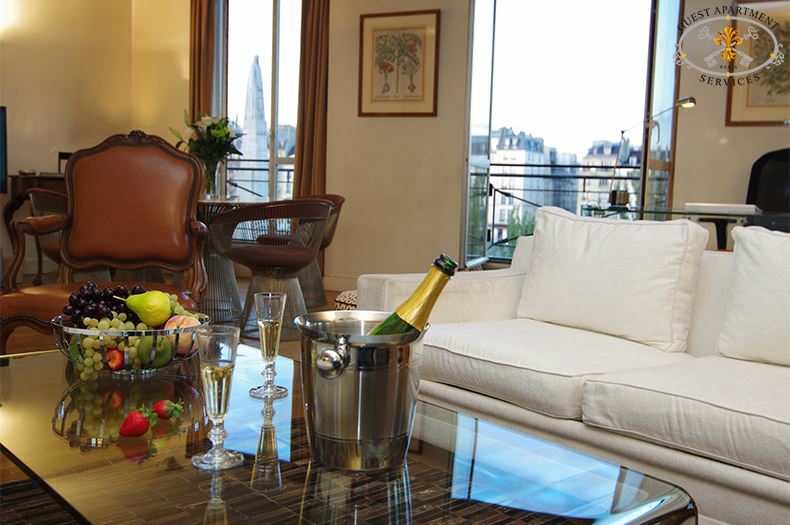 We had a wonderful stay in the apartment Gloriosa, and very much enjoyed our time there and in Paris. Thank you for all of your assistance with the apartment, our questions, and dinner and concert reservations.